So what’s hot with senior fitness this year? It’s all about embracing the future of digital technology while also harkening back to the basics and approaching exercise with a mind-body lens focused on overall wellness. Senior fitness is critical! When the entire Baby Boomer generation finishes aging into the 65+ age bracket around 2030, they’ll comprise 20% of the U.S. population – wow! 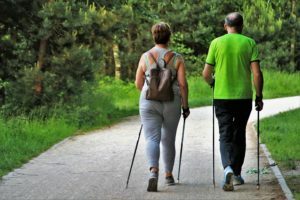 Where expert recommendations for older adults used to focus on resting and avoiding exertion, recent decades of scientific and social research has found that staying active and regular exercise play important roles in healthy aging, fall prevention, and fighting age-related diseases like Alzheimer’s and dementia. Popular with younger generations too, wearable fitness technology has exploded in the past few years. From FitBits to BellaBeats, wearable fitness technology typically looks like a sleek bracelet or pendant which you wear to track personal health stats like steps taken in a day, heart rate, etc. Synced to an app you access on your smartphone or computer, you can also track your diet and nutrition, calories burned, and even your sleep quality. As boomers age into retirement and the largest generation by numbers so does their disposable income and ability to pay for exercise classes and trainers. Gyms and fitness centers are picking up on this trend and offering more and more senior classes than ever before. At the same time, the renowned Silver Sneakers premier fitness program is still going strong, offering no-cost, unrestricted access to 13,000 participating gyms across the U.S. for senior citizens. Blame it on climate change, or simply the fact that southern city populations are growing at exponential rates (hello, Florida! ), but getting outdoors is trending big time with the 65+ crowd – from outdoor yoga to hiking, and most recently spreading all across the world, senior wellness playgrounds. Why hit the gym when you can play outside on a customized playground engineered for older generations? Senior playgrounds might include stationary bicycles, face to face leg presses, low balance beams, games like boule or horseshoes, walking paths, and more. This industry term, “functional fitness,” has been thrown around for a handful of years now, but as more and more Boomers hit the gym, it’s practicality remains quite popular. Functional fitness simply means exercising and strength training for the daily activities you need to complete. Examples include building up forearm and back strength for lifting groceries or caring for a spouse, focusing on leg strength and agility for climbing stairs and rising from a chair successfully. Functional fitness routines focus and prioritize cardio, strength and resistance training that makes sense for older adults who, for example, might not be looking to run marathons, but want to stay healthy and strong enough to mow the lawn, lift bags of mulch, and prepare their annual vegetable garden. As more and more research emerges about natural pain treatments, i.e. for osteoarthritis or acute back pain, exercise is being positioned as a go-to pain solution recommended even before pharmacological methods are taken. For example, at the beginning of 2017, the American College of Physicians issued updated recommendations for clinicians treating patients complaining of acute and chronic back pain. In addition to exercise (which helps stretch tense muscles and boost blood flow to fight painful inflammation), the ACP recommended patients try heat therapy, yoga, acupuncture, and massage before taking over-the-counter NSAIDs or prescription pain killers. A rise in mind-body exercises which embrace meditation, relaxation and deep breathing in addition to movement, stretching, and poses is bring mindfulness to the forefront of senior fitness. With a focus on self-actualization and peace, senior yoga is proving to not only help build muscles and bone density but combat stress and anxiety, and stimulate positive cognitive function to fight memory loss and dementia. Did you know that over 80% of older adults complain of at least one incidence of foot pain, though few actually report seeing their doctor about it? This is changing, for the better. Foot pain can not only impair mobility and cause dangerous falls, but it can also prevent seniors from staying active and getting the exercise they need. Addressing the underlying causes and treating foot pain is on trend when it comes to embracing an active and fit lifestyle. Over the counter aids like orthotic inserts for plantar fasciitis or arch supports for high arches might be recommended by your doctor, while proper foot care to prevent skin breakdown and stretch foot muscles can be as simple as washing, drying and moisturizing feet nightly.